MINNEAPOLIS, MN – Join Arizona All-Pro Wide Receiver Larry Fitzgerald at the Larry Fitzgerald Football ProCamp. The camp takes place July 16, 2016 at Academy of Holy Angels, 6600 Nicollet Ave S, Minneapolis, MN, 55423. For Boys & Girls, Grades 1 to 8. Source: Procamps. The Camp is closed to the public, but is free and no cost to participants. Spots may still be available. Interested campers can join the waitlist at this link and will be contacted directly should a spot become available. Date, times, and location subject to change. 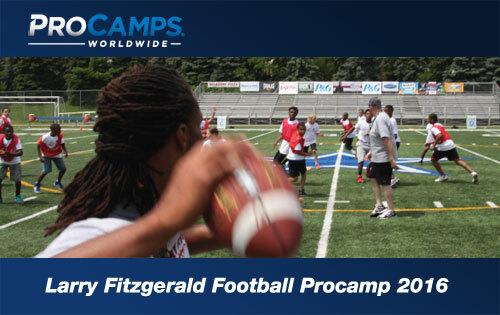 Throughout the one-day camp, Larry Fitzgerald and our camp coaches will offer tips and instruction. Campers will experience various stations specializing in fundamental football skills and will participate in games and contests. Campers will be placed in small groups by age to ensure that each child gets maximum instruction. Sports Speakers 360 is a booking agent for pro athletes. If you would like to book Larry Fitzgerald for a speaking engagement, appearance or endorsement, contact an Larry Fitzgerald booking agent for fees at 1.855.303.5450.